At its most recent meeting, the Town Center Community Improvement District (TCCID) awarded the contract for the development of Aviation Park and Bells Ferry Trailhead enhancements to Integrated Construction and Nobility, Inc. TCCID expects to break ground on both greenspace initiatives in mid-May, with an anticipated completion date in the first quarter of 2018. While Town Center has traditionally been associated with retail and commercial activity, the upcoming park projects are key steps towards enhancing the community and making it a more inviting destination for visitors and locals. The Aviation Park and Bells Ferry Trailhead projects align with TCCID’s recently updated Master Plan and its vision to create a greater sense of place and make Town Center a community where people want to be. Three-acre Aviation Park will be located at the end of the Cobb County International Airport runway at the corner of Barrett Lakes Boulevard and Cobb Place Boulevard, about midpoint along the Noonday Creek Trail. Designed by Arcadis with initial concepts by Winter Design, the park theme will pay tribute to Cobb County’s rich history in aviation, featuring a viewing pavilion where visitors will have a prime spot to watch the nearly 200 planes take off and land each day at the airport. 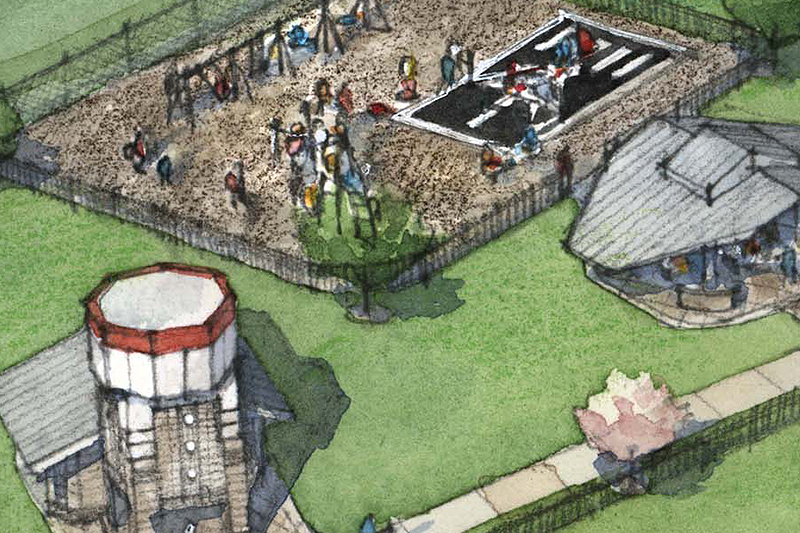 It will also include an aviation-themed playground, restrooms, historical information and a public art display, while incorporating the existing Zagster bike share station. Aviation Park will be a high point of interest along the trail, which connects attractions throughout Town Center. It represents the first effort of its kind for the district, with the TCCID undertaking planning, design, construction and funding of the entire project. Though its theme is a nod to Cobb’s history in flight, Aviation Park features modern amenities. The playground showcases a rubber mock runway under a Corocord airplane structure, which consists of a rope and cable climbing system. Spinner bowls mimic the light placement along a typical runway, as well as standard, toddler and basket swings for ADA accessibility. Finally, an ICON climbing structure will offer park visitors a combination of a S.T.E.M. (Science, Technology, Engineering and Math) themed electronic play system and physical activity. Included as part of the awarded projects are enhancements to the Bells Ferry Trailhead, which serves as the eastern entrance to the Noonday Creek Trail. Currently, the trail features a 60-space parking lot and a Zagster Bike Share station. The planned updates will make the space more visitor-friendly, including the addition of restrooms, plentiful trash disposal, a seating plaza, lighting and landscaping. The cornerstone of TCCID’s place-making efforts will be the creation of Town Center Park, a 42-acre space adjacent to Town Center Mall that will be part greenspace network, part cultural park and part pleasure ground. It will have a nature-inspired water feature, a linear park along the Noonday Creek Trail and a woodland park for ecology and education use. Currently in the planning phase, survey crews have begun initial work analyzing conditions, boundaries and assets and collecting information for the design team. Crucial to ongoing park development is the newly-created Town Center Community Alliance (TCCA), a 501(c)3 established by the TCCID that enables property owners outside of the district to invest in its park and green space initiatives. Working alongside TCCID, the TCCA is leading beautification and place-making projects, and funded philanthropically.